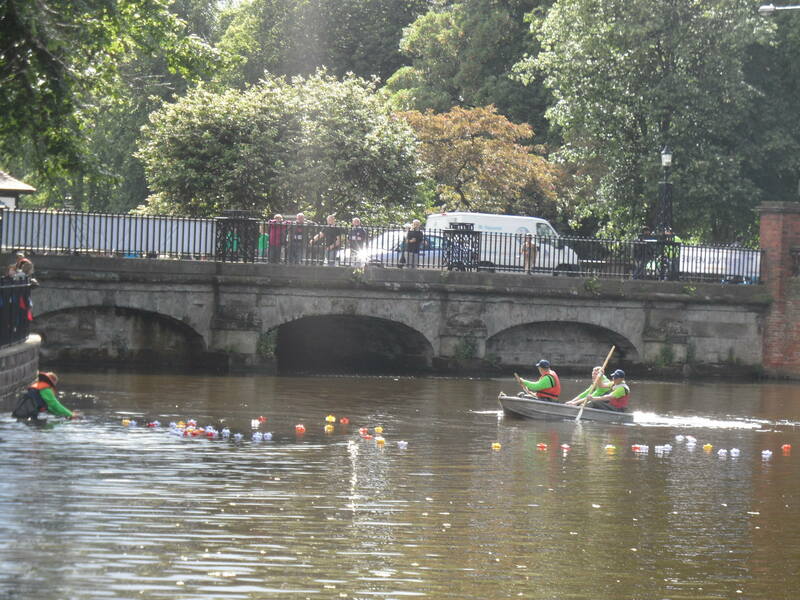 It might not have rained on St Swithin’s day here in Lichfield but water was still the theme this weekend. On Saturday, I was supposed to be at the Festival of History at Kelmarsh in Northamptonshire. However, it seems that nature wanted to get involved in the reenactment of history too and successfully managed to put the marsh back into Kelmarsh. Maybe Dr Rawson was right when he warned “Drive nature out as you will, and she will come back”! Here in Lichfield, I’ve read that marshy land was known as ‘moggs’ and that the Museum Gardens were once known as Swan Moggs or the Bishop’s Fish Pool. You can see an artist’s impression from 1848 of the scene in 1548 here. 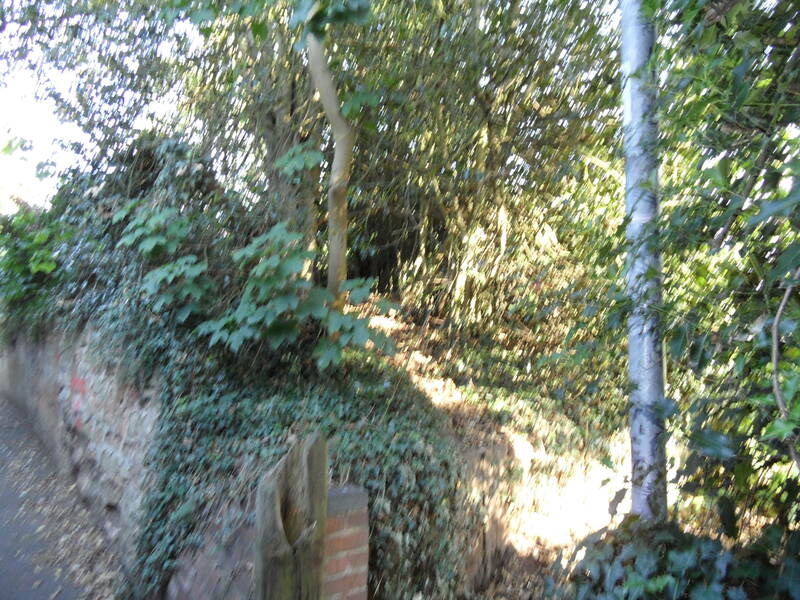 A causeway was built to separate the Moggs from from Minster Pool in the early 1300s, and the road became known as Newebrugge St, later Brugge St and eventually Bird St. According to Rawson, the original bridge was widened by 5 foot in 1768. It was replaced by a new bridge in 1816, but I was quite excited to see that the listed building description says that the remains of the old bridge could still be below the water of Minster Pool. Has anyone anyone ever been down there to have a look, I wonder? I’m probably not quite excited enough to hire a wetsuit and go looking for it, but you never know! It seems that other interesting discoveries have been made near the site of the bridge. According to the Pastscape record, during the 19th century there was a malthouse on the causeway and in 1802, when they were digging a well they discovered a roman goblet called a cyathus and fragments of several human remains. How did they come to be there? 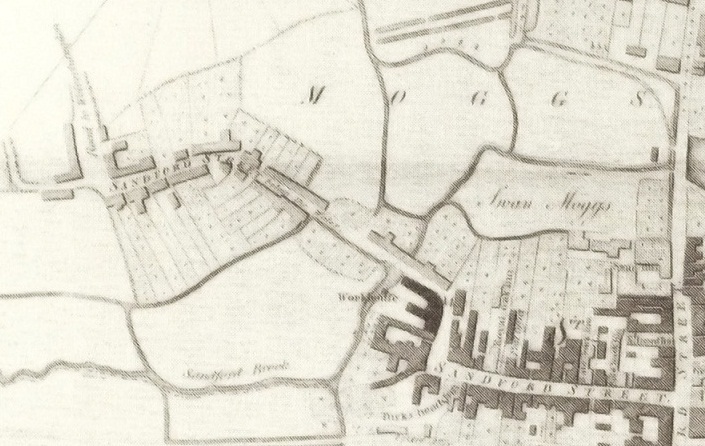 Once again, it’s worth taking a look at John Snape’s 1781 map of Lichfield as it show the extent of the Moggs at that time. While we’re at it, here’s John Speed’s 1610 map again as well! 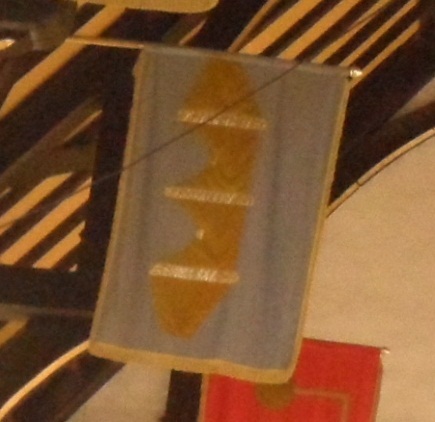 As you might expect, the Bird St ward banner features the Causeway. Something I’m especially interested in relating to all this are the references I’ve seen to a well in the vicinity. So far, I’ve seen it called Merelynswele, Merliche Well and Maudlin’s Well and various sources seem to place it adjoining the Bishop’s Fish Pool, and accessible from Shaw Lane. I might be wrong but is the original name made up of three watery elements i.e. Mere-lyns-wele with mere as in Windemere, lyn deriving from the celtic word for for lake and of course wele for well? The name of the well seems to have changed over the years. For example, John Jackson suggested that the well became known as Maudlin’s as, ‘Tradition says some person having enjoyed his bottle rather too freely tumbled into this well which has since been distinguished by its present epithet Maudlin signifying a state of inebriation. It is clearly however an abbreviation of Magdalen’s’. Dr Rawson referred to it as Merliche, the pool-marsh well. Why is Beacon St called Beacon St? Once upon a time it was known as Bacon St (or variations of this such as Bacunne). It’s suggested that at some point around the beginning of the 19thc, someone decided that Beacon St was a more fitting name. It’s pure speculation on my part, but I wonder whether this name change had anything to do with the building of Beacon Place around 1800? The man who built the house was called George Hand. As there’s a cut of pork called ‘the Hand’, maybe he was keen to distance himself from all things porcine? As I said, mere speculation. Is there any truth in this explanation? Or is a story, created to support the name change? Is there any other evidence of an actual Beacon? 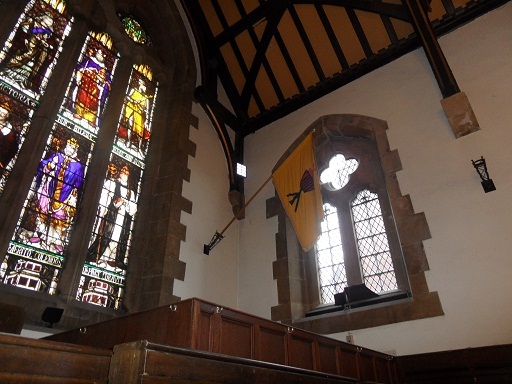 The above ward banner in the Guildhall surely relates to the Beacon St ward (although it’s another one where the name plaque is obscured). Alone it’s not evidence for the Beacon theory, although as I’ve mentioned before, I would be interested to see when/where the designs for these banners came from. There is a place in Lichfield called Dean’s Croft, but it’s near St Michaels, not Beacon St.
Thomas Harwood’s book (2) throws another explanation into the ring. It is probable from the situation of Bacon street that name is an abbreviation from Barbican or Barbacane a word of Arabic original (sic). A barbacan is a sort of hold or fort for the security of the a munition placed in the front of a castle or an outwork. In 1886, the William Salt Archaeology Society noted (3)’The present spelling of the name of this street is altogether unauthorised, and an innovation of this century. It is found spelt Bacon, Bacun, or Bacune uninterruptedly from the 13th to the 18th century’. Likewise, I’m not convinced by the Beacon or Barbican theory….yet. As ever, would like to know what others think. I wonder what the good people of the Bacon Beacon Street Blog, think? Referring to the Beacon St area, the Collections for a History of Staffordshire Part II- Vol VI (1886) record that there is a reference to a Bacone’s Cross, along with a Swane Lane (now Shaw), Merliches Well, Poole Hall and Whitehall that I missed before. Changes is a mental health organisation offering a range of services including friendly mutual support groups, social activities and opportunities for accredited training via the National Open College Network. These services can be accessed for free, without the need for a GP referral. Local volunteers are helping to run the service in the Lichfield area. In addition to these services, Changes also run wellness courses for people in mental distress, and the next one starts on Monday 23rd January between 10.30am & 12pm at the Pavilion in Beacon Park. The course is free of charge and public transport costs can also be met. Changes was formed by people with experience of using mental health sevices, to help both themselves and others in the same situation. They aim to provide personalised support and services, greater independence and to help people with their social skills, to regain confidence and to become active members of their community. If you would like to find out more about the course, or to find out more about the service generally, you can visit the website www.changes.org.uk or contact Ann at the Lichfield Wellbeing Centre on 01543 309 770 or Samatha at the Burntwood Wellbeing Centre on 01543 679 000 who would be pleased to answer any questions you may have. Following on from my last post about Beacon Place, here are my initial attempts to discover what’s left of the estate. Here’s a map of the Beacon Place area from 1921. It shows the the Greenhough Rd lodge, the Beacon St lodge and the Sandford St lodge (although this isn’t indicated, it’s the building near to the PH on Lower Sandford St, in the parcel of land marked 332). It doesn’t show the Christ Church Lane lodge, but I’ve covered this elsewhere anyway. Apart from the Sandford St Lodge, which I think would have been located near to Bunkers Hill car park, the lodges are still in existence. A lot of the trees are also still there, the line running down from the icehouse to Christ Church is still very much in evidence. The fish ponds also remain of course. As we know the mansion no longer exists, and houses were built on the area. 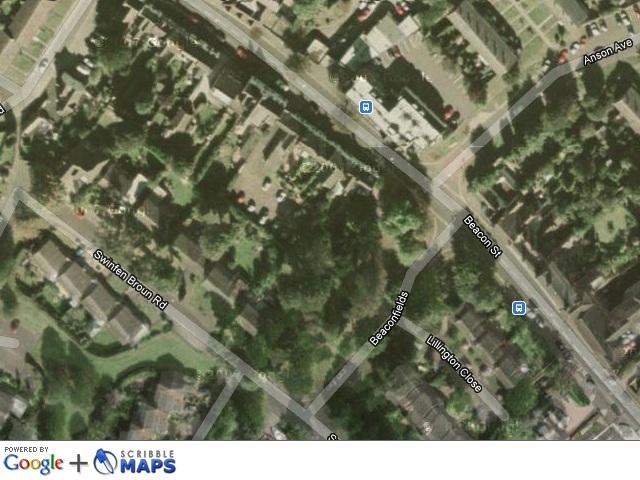 I think it was located somewhere in the region of Seckham Rd. What’s interesting, although I suppose it makes sense, is that the new roads in this area seem to follow the line of the old carriage drives shown on the 1921 map. For example, if you compare the google map* below, the route of Swinfen Broun Rd is similar to the that of the carriageway from the Greenhough Rd lodge. 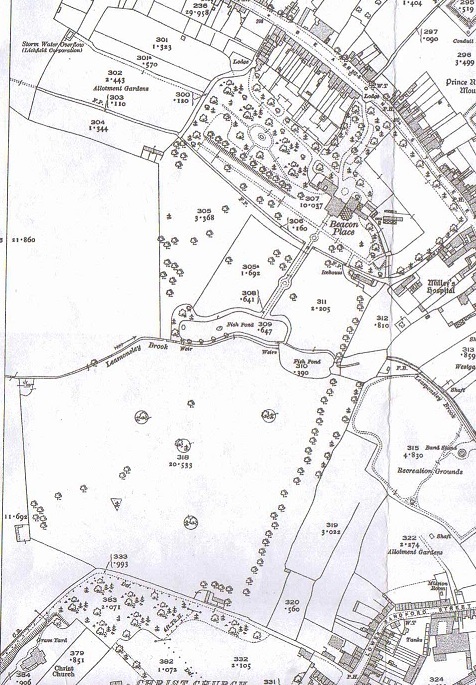 Beaconfields seems to follow the line of the carriageway from the Beacon St lodge. I think that the icehouse shown on the map is located between the Shaw Lane carpark and the pavilion near to the playground, where there is a definite bump in the ground which seems to correspond with the map. It doesn’t come over particularly well in the photograph unfortunately, so the next time you’re in Beacon Park, you’ll have to go and have a look yourself! 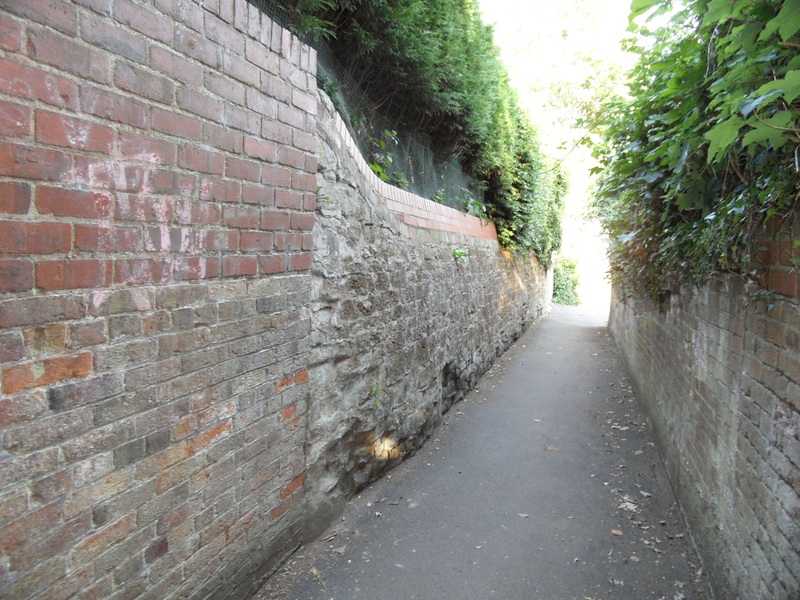 The footpath marked next to it on the map is also still in existence. 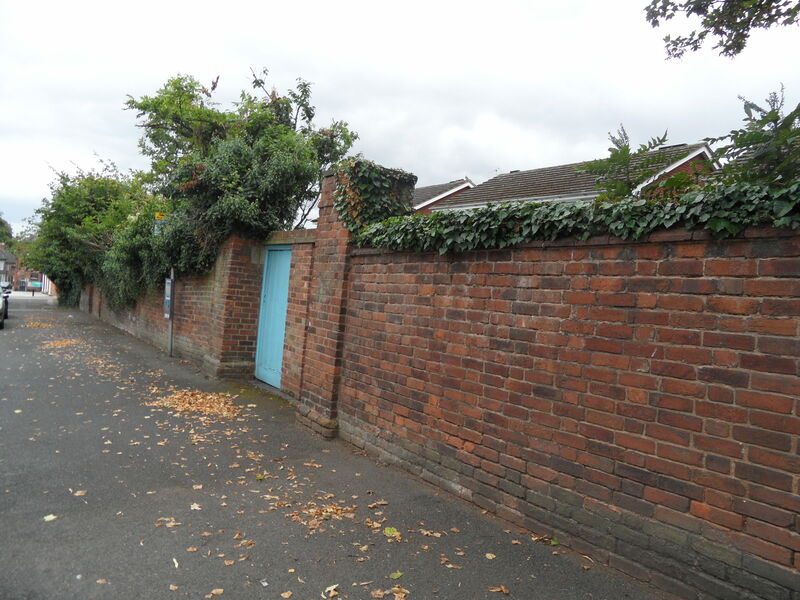 I think part of the estate’s boundary walls are between Beacon Mews and Beaconfields, on Beacon St. 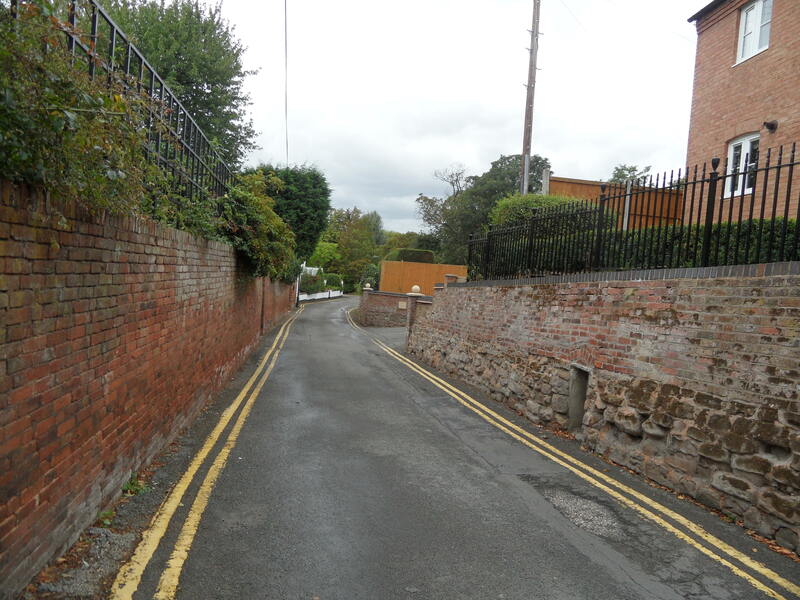 There are also some walls running alongside Shaw Lane. I wonder what that gap in the wall was for? I should have taken a better picture of it! So, these are my findings so far. I’m hoping there will be more. The map shows a couple of other buildings (e.g.two fairly near to Christ Church, some near to where the ice house), so I’d be interested to know what these were. If anyone has anything to add (or if I’ve made any mistakes – I’m not great with maps! ), please let me know. Oh and if any one wants to see any other bits of the 1921 Lichfield map, get in touch. This beautiful photograph is of Clara Talbott, and it was her prize for being chosen as the Lichfield Bower Queen in 1931. Clara was the third Queen to be crowned and although other parts of the Bower date back to much earlier, it seems this tradition only began in 1929. The Lichfield Mercury reported that Clara’s ‘long auburn hair had provided a very favourable comparison with the more modern ‘bobs’ and ‘shingles’. It goes on to tell us that Clara was assisted by her ‘fair maids of honour’ Misses R Orton, M Barker, F Nevill and K Carroll. A mirror was used to give the impression of a reflection in water. 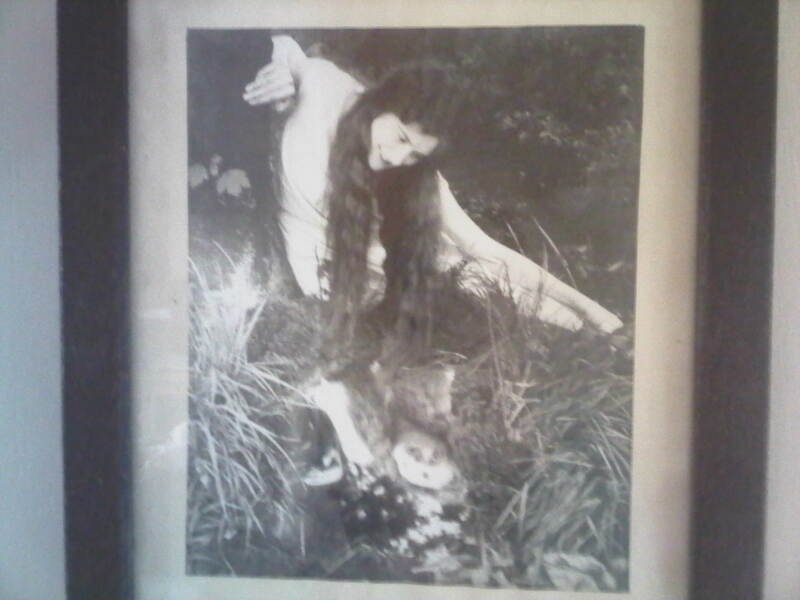 The photograph belongs to Vickie Sutton, Clara’s granddaughter. She told me that the photograph was taken in woods around Leomansley, where the A51 western bypass now cuts through the woodland. I understand that these trees here were planted by the owners of the now vanished Beacon Place. 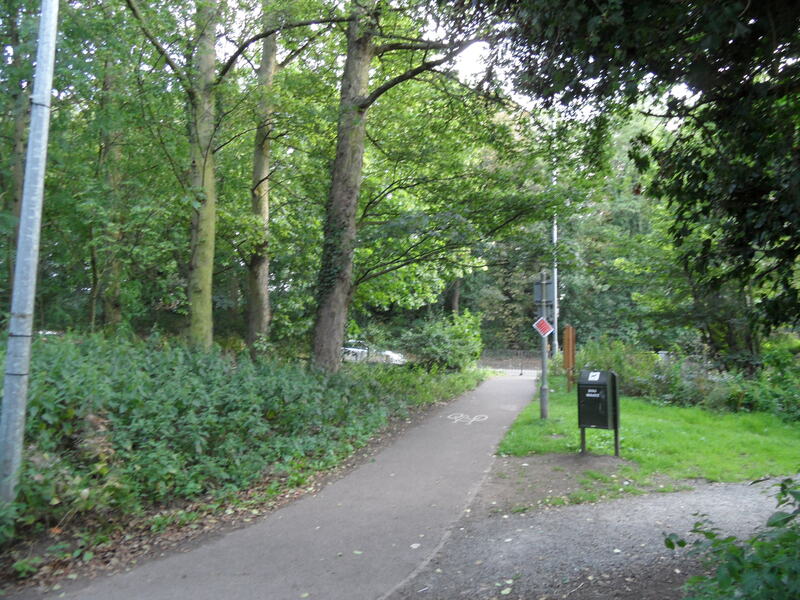 Woodland at the edge of Beacon Park and the old carriage driveway from Christ Church to Beacon Place, with the A51 through the middle! Clara’s family farmed land on Beacon Park and once married, Clara and her husband Frederick Hatchett lived in The Lodge in Greenhough Rd. As the name suggests this was a lodge for Beacon Place and at one point was used as a laundry for the house – it was known as Laundry Lodge in 1891! Vickie has heard from a family member that it may also have been used a some sort of cafe for soldiers in the first world war. I haven’t been able to find any specific references to this yet but records show that Beacon Place was used by officers during WWI and was purchased by the war department in 1922. Cuthbert Brown remembers military figures entering Beacon Place in his wonderful book ‘Lichfield Remembered’. Once again huge thanks to Vickie for allowing me to share this. The Beacon Place Estate is definitely on my list of things to explore. It may be long gone, but traces of it still linger on…. Chatting to Vickie Sutton, font of Lichfield knowledge!